As with other industries, the aviation industry's existing non-IP networks for radar and weather data and the associated infrastructure can be considered obsolete. The networks still work, but they are slow, and expensive to maintain. There is just too much communication equipment from different companies, many of them long gone, and a declining knowledge of how to maintain this equipment. IP networks (intranets) are already in place. They are faster, cheaper and easier to maintain. 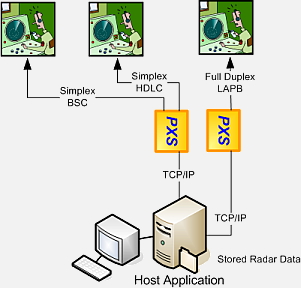 Systems creating radar data often use synchronous interfaces and protocols compatible with the legacy networks. Replacing or upgrading these systems is expensive. New technologies, such as GPS, may soon render these upgrades obsolete as well. The radar system output is normally RS-422A. If an RS-232C narrowband microwave radio modem is used to connect to the local airport, an RS-422-to-RS-232 converter is needed. 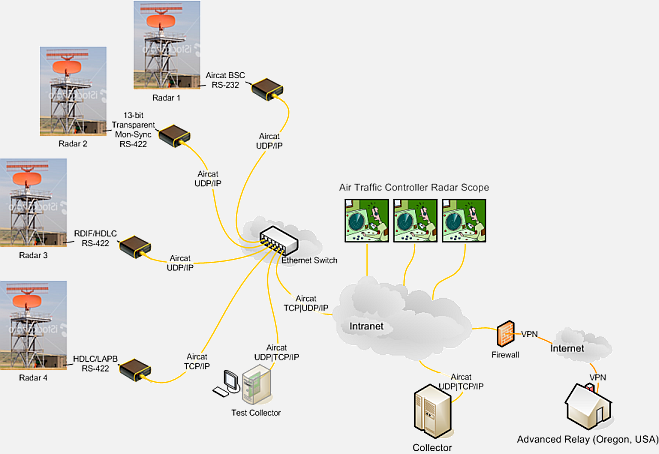 If an intranet connection can be established at the radar site, Advanced Relay's PXSe can directly connect to the RS-422 interface. Exchanging the synchronous interface for IP/Ethernet will enable the radar sites to feed their data directly into the intranet. The benefits are dramatic! The whole legacy network and associated equipment can be removed. Eurocontrol adopted the CCITT Recommendations X.25 as their transport protocol: raw mode HDLC, LAPB, and X.25. Older, often military, radar systems may still use Bisynchronous protocols (for example, the Aircat 500), or 13-bit boundary protocols, which we normally handle with a special Monosynchronous driver. X.25 is mostly used as a network protocol between multiple sites. Radar data is created by radar sweeps about every four seconds (newer systems may have shorter periods). Transmission is normally simplex or unidirectional. Full-duplex, error-free HDLC LAPB or X.25 connections only make sense if the error correction takes less than the four second sweep period. This can be accomplished by using a short LAPB T1-timer (less than 1 second) at the radar site (DTE). If no acknowledgement is received from the DCE during the T1 time interval, the frame will be automatically resent. If the DCE had received the previous frame correctly, it will discard the resent one. Radar and weather data generally have more than one destination. They are displayed in real time in one or more ATC Radar Scopes. In addition, they have to be archived for analysis and possibe later replay. IP multicasting can be used to send the same data to multiple registered users. These users may dynamically join or leave a Multicast Group. Advanced Relay developed a product for Air Services Australia where weather data arriving via X.25 are forwarded via IP multicast to multiple sites. In 1990, Eurocontrol Karlsruhe in Germany joined with France, the Benelux states and Switzerland to use Advanced Relay's PC.25 product to enhance the safety of air navigation in the west European air space. Previously, the use of military and civilian airspace was badly coordinated. Our PC.25 product (ARX.25) used the Emulex DCP-88/VM with our X.25 protocol software. Eurocontrol purchased an ARX.25 source license which was later transferred to the DFS (Deutsche Flugsicherung GmbH) Darmstadt. The product was used to facilitate intercommunication between airports and radar sites in the Western European region. Aerospatiale (now EADS), used our LAN X.25 Bridge (XBridge) product to allow intercommunication between their American and European operations. Honeywell Commercial Flight Systems Group used XBridge to exchange flight data between Europe and the U.S. using the Tymnet X.25 PSDN. One of our first LayGO projects was for Norden (NGC) where we developed a LAPB/BSC to TCP/IP gateway, routing radar data via TCP/IP to an ATC workstation where the data is processed and displayed. The system is used by Changi Airport, Singapore. The same product was used by the Polish Air Force. In 2000, we developed a half-duplex, transparent HDLC driver for the FAA to track airborne aircraft. The driver uses Sealevel's PCMCIA card and includes time-stamping each frame as it is received. The FAA also uses our LayGO/X.25 to capture, display and store radar data from the Eurocontrol Asterix protocol. Park Air Electronics UK (now NGC) uses our LayGO/LAPB for their 5525 D8 radio. For Honeywell we developed the LayGO/LAPB on a PC/104 system used by a base station modem that interfaces to a Park Air 5525 radio via LAPB. In this case our LayGO/LAPB and synchronous adapter is used on both ends. The product is used to broadcast weather information gathered by a large network of weather stations in North America to airports and airborne aircraft. Dansk System Elektronik Airport Solution (DSE A/S) was the first aviation customer for our PXSe product. We implemented drivers and software interfaces supporting BSC, raw mode HDLC and LAPB to store and replay radar data. A similar product was employed by the Chilean Air Force. Air Navigation and Weather Services (ANWS) Taiwan uses the PXSe as a gateway from transparent bit stream (13-bit SYNC character) to TCP/IP. We developed a special Monosynchronous driver to handle the special bit-synchronous mode. 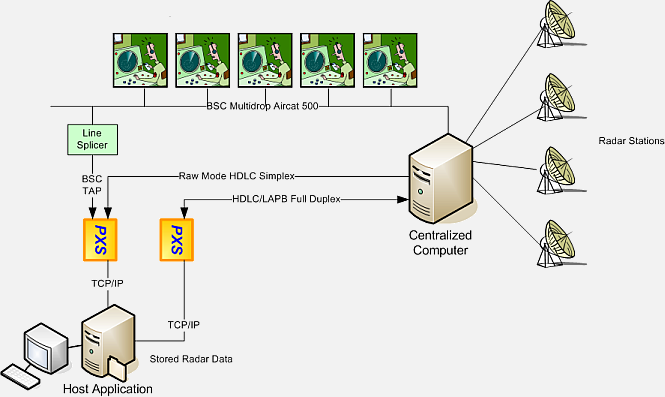 Remote System Integration (Millington, TN) uses the PXSe in an AWOS (Automated Weather Observation Systems) application. The PXSe extracts weather data from a TCP/IP stream and forwards it via X.25 and a CSU/DSU to remote airports. Apparently airports are still using the X.25 legacy protocol. A better solution would be to eliminate the X.25 interface at the airport. Air Services Australia uses the PXSe as X.25-to-UDP gateway to allow multicasting. We developed an X.25 Broadcast Server (xcast) that forwards weather data received from X.25 virtual circuits to remote stations using IP multicast. Hong Kong Airport CAD (Civil Aviation Department) uses the PXSe as an RDIF HDLC-to-TCP/IP gateway. It also supports HDLC LAPB. 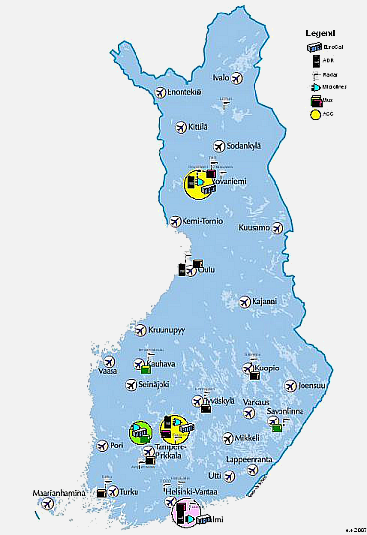 FinAvia Helsinki uses the PXSe as an RDIF HDLC-to-UDP and HDLC/LAPB-to-TCP/IP gateway. Both interfaces were successfully tested. Full deployment has been delayed due to company reorganization.